On 30th January Thomson Reuters announced an agreement to sell its Financial & Risk unit to the private equity fund Blackstone. The value of the business has been estimated around $20 billion. Blackstone, together with Canada Pension Plan Investment Board and GIC Pte, a Singapore’s sovereign wealth fund, will acquire 55 percent of the business, while the other 45 percent will remain under Thomson Reuters’ control. Thomson Reuters will obtain approximately $17 billion, consisting of a $3 billion cash equity contribution by Blackstone and $14 billion of debt and preferred equity. The debt will be mainly provided by Bank of America Corp., Citigroup Inc. and JP Morgan Chase & Co.. The transaction is expected to be closed in the second half of 2018. At the closing moment, F&R will enter a 30-year agreement to get news and editorial contents from Reuters News, paying $325 million a year. The F&R unit provides data, analytics, tools to enable financial professionals around the world to make fast and efficient decisions. One of its most popular instrument is “Eikon”, a set of financial analysis tools. Therefore, Blackstone will become a direct competitor of Bloomberg, which is the current world leading financial data provider. 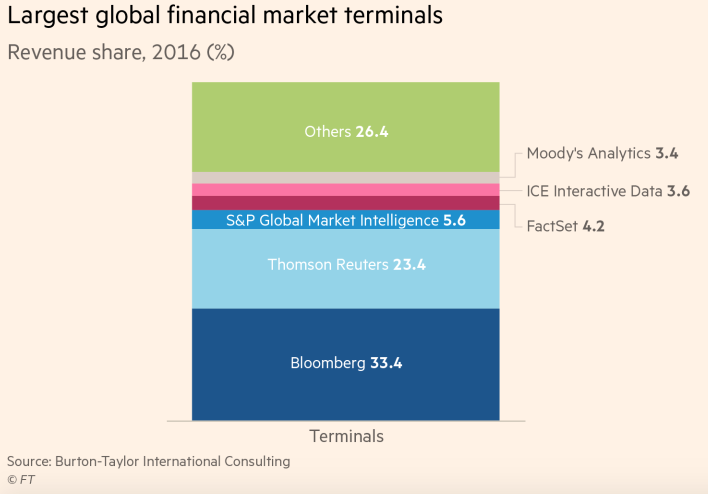 As shown in the graphic below, Bloomberg has a share of 33.4% among global financial market terminals, while Thomson Reuters has a share of 23.4%. One of the most interesting comment about this transaction was made by Blackstone Group LP President Tony James who said that the future of this business is selling data and not selling terminal desktop products to bankers, traders and investors. These words demonstrate the importance of data in modern financial markets and clarify that Blackstone strategy is to get profit from this increasing need of data. We are living in a period where the amount of data available is huge and knowing how to manage it and how to interpret it is absolutely crucial. An example of this phenomenon is given by the regulation. After the introduction of IFRS 9 on 1st January 2018, banks have to provide provisions for credit losses with a forward-looking approach and not only when a default occurs. Therefore, they are required to constantly estimate the probability of default of their borrowers. Data providers help them to correctly assess the creditworthiness of their counterparty through historical databases and advanced statistical models. The regulatory changes together with the fact that Blackstone is one of the biggest fee payer to investment banks around the world explains the logic of this acquisition. Indeed, Blackstone could use its strong relationships with Wall Street professionals to convince them to use Thomson Reuters platforms rather than Bloomberg or S&P terminals. At the same time, financial professionals are likely to accept this change in the hope to win more business from Blackstone. If this strategy will be successful, Blackstone could relatively quickly sell the business to other actors such as Intercontinental Exchange or the London Stock Exchange Group.